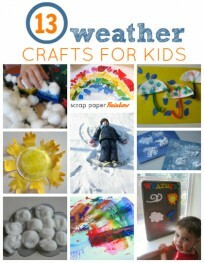 We can all be Meteorologists ! This is an old post from February that I added new book reviews and an additional activity to. My little helper is missing because in February he wasn’t able to play with cotton balls without eating them.Have a great weekend , there will be a new post up on Monday! 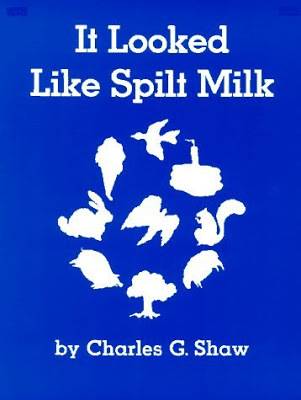 We are mixing things up today I am talking about a book first because ” It Looked Like Spilt Milk” by Charles G. Shaw goes perfectly with our activity. In the book all different shapes are shown and the children love to tell you what it is, an ice cream cone, a bird… but really they are all clouds! After reading I will ask students if they have ever seen a funny looking cloud and if they would like to make a funny looking cloud!You don’t have to use this book, you could just pop outside and find some clouds and talk about their shapes too! Gather your materials. I am used cotton balls, some card stock , a marker and white glue. Oh and don’t forget the scissors. 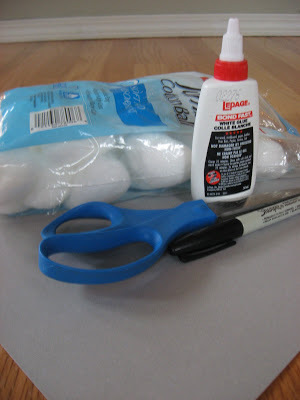 If you don’t have cotton balls you can use tissue paper cut up or even toilet paper! Draw the outline of the cloud, I have made a very boring every day cloud but allow your child to make any shape they want and if they can draw it, let them. I would only draw the outline for very young toddlers. 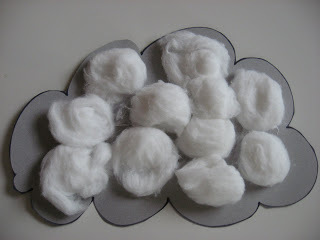 Put glue all over the cloud , and put on your cotton balls. Even really little guys love this part, but watch them they also love to pop them in their mouths. What’s the weather like today?Is it sunny? Is it cloudy out today? 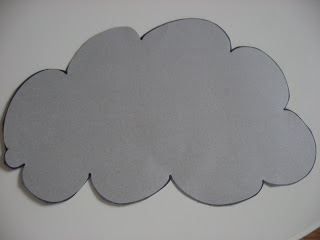 One of my favorite activities to do with children after reading this story is to take a blue piece of construction paper, and white glue and make fold over clouds. 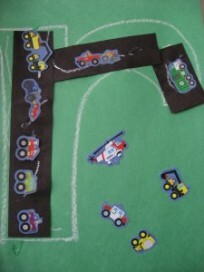 It’s super simple and fast , so you might want to have a few pieces of paper for each child. You simply add white paint to one half of a blue piece of paper, fold , squish and open it up. See if there is a hidden image, we once found a piece of pepperoni pizza in one! 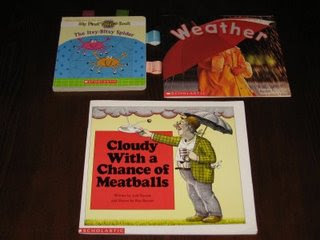 ” Cloudy with a chance of meatballs” by Judi Barrett is a fantastic book for Pre-K and up, if your child has a long attention span I would try it earlier , but the text is long and complicated for most toddlers. My son won’t sit for more than a few pages if I am lucky. The story follows one Grandpa’s tale about the town of Chewsandswallows where the weather comes in the form of food! All was well in Chewsandswallows until the weather took a turn for the worse! I loved teaching with this story, and kids love it too! ” Weather” by Pamela Chanko and Daniel Moreton is the perfect little non fiction book about weather for toddlers and young preschoolers. It’s short and has big interesting photos depicting different weather. Don’t be fooled, it looks like nothing, but trust me little guys will ask you to read it again and again. It’s important that children get read a variety of things, not simply fiction, so don’t be afraid to get your child a simple little non fiction book like this one! ” The Itsy-Bitsy Spider” by My First Taggies Book is a fun little book with the ever popular tags which add an extra level of sensory experience for your little one. The pictures are cute, the rhyme familiar and I liked traveling with this book when my son was little, because of the tags it was a double duty, book and touch toy! Next Post: Letter of the Week ! Q q ! Previous Post: Be Featured ! Adorable! 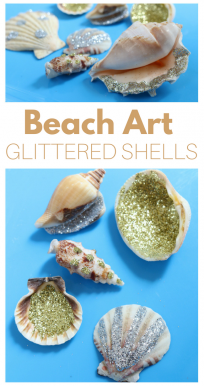 My kid will love this! Thanks for doing all the thinking for me! Don’t forget The Little Cloud by Eric Carle! Great weather song. I will have to use that one. Currently we use a puppet with sunglasses/hat/umbrella & sun/clouds/snowflake, etc. We call him "The Weather Dude" and the kids love it. Gotta change things up once in a while! I'll be checking your bog for new ideas. Thanks! Having your child pull the cotton balls apart a little bit before gluing also helps with fine motor skill development (strengthens bilateral coordination).